University Circle was born when two universities loved each other very much and... oh wait, that's babies. University Circle came to be when two universities in Cleveland, Western Reserve University and Case Institute of Technology, were looking to relocate and they settled around an area with a circular street intersection and a traffic turnaround created at Euclid Avenue and Doan Brook Boulevard (which would become Martin Luther King, Jr. Boulevard). Hence the name, University Circle. There are a lot of twist and turns and I must say driving around there can make me dizzy. 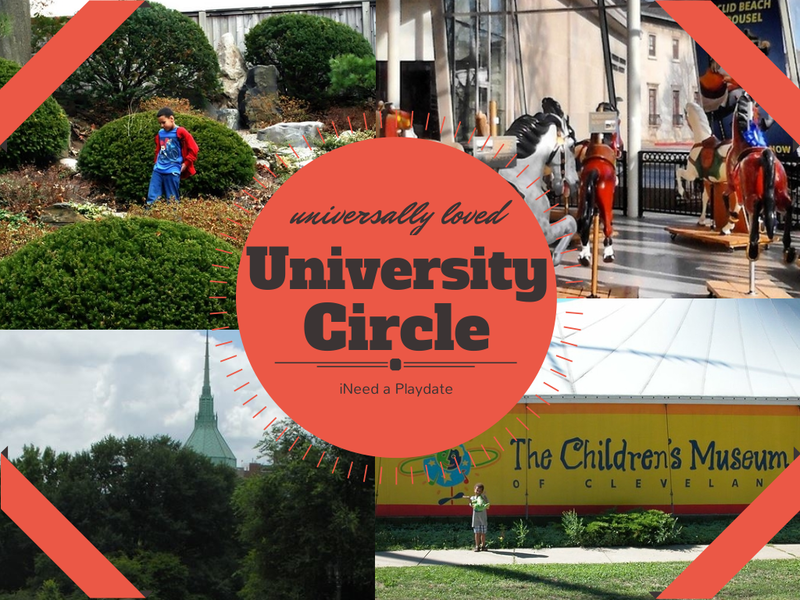 "Roughly 1-square-mile in area, University Circle is a City of Cleveland neighborhood located 3 miles east of downtown, 2 miles south of Lake Erie and directly west of the inner ring suburban communities of Shaker Heights, Cleveland Heights and East Cleveland. Besides being the home of what is now Case Western University and the Cleveland Institute of Art, University Circle is the home to the majority of Cleveland's museums as well as our orchestra. University Circle is spectacular and for this westsider, a little excotic. Don't laugh, I was an art major in high school and loved to visit and explore the art museum. This was not cool. There is an energy surrounding this area that is addictive and you want to belong. And, for a brief minute in the 90's, I lived in the area and realized I prefer to visit, but that had more to do with a bad relationship and missing my family. Needless to say, I visit when I can and enjoy the many activities that the Circle has to offer from Parade the Circle and Wade Oval Wednesday to Chalk Fest and CircleFest. Post by University Circle Inc. Since I already posted about my favorite museums and the orchestra, today I thought I would share some other goodies like the duck pond. This stunning pond is located in the Cleveland Art Museum's front lawn. The lush green lawn and serene pond make a wonderful setting for relaxing and enjoying the day. Wade Oval Wednesdays happen all summer, every Wednesday and feature free concerts on the lawn. The free concerts start at 6:00 PM which is just enough time for me to leave work, grab the kids, dinner, and head over. Parking is no joke and I usually ended up paying for it but if that is all I have to pay - hooray! They also feature a movie twice during the summer and I will post these on my calendar of events. Parade the Circle is an annual parade but it is not just a parade but a festival with a parade plus music, dance, crafts for the kids, and good food. Most is free and it is just a sea of amazing color and fun. When I was in high school, the Parade was still pretty new and in 1992, just a few years after it started, a group of girls in my art classes got together and we dressed in renaissance costumes and participated. It. Was. So. Fun. Over the years I have gone sporadically, as a bystander, because it tends to be the same weekend as another festival I take the kids to see. I think this year I will make it a point to go to Parade the Circle instead. I mentioned CircleFest in my list of Favorite Northeast Festivals. Despite going for the last several years with the kids I always forget that there is a lantern event as well. I will not be making that mistake again. University Circle is unequivocally one of the most beautiful places in Northeast Ohio - an urban utopia of music and art.